SAN JOSE – Hawaiian Airlines, Kristi Yamaguchi and her Always Dream Foundation partner with the San Jose Downtown Association to produce the Hawaiian Airlines / Kristi Yamaguchi Downtown Ice, presented by Sobrato Organization rink Nov. 18 through Jan. 16. at the Circle of Palms, 120 S. Market St.
Yamaguchi, the 1992 Olympics figure skating gold medalist, will help with opening celebration at Nov. 23 at 5 p.m. at the rink. Family and friends, along with fellow ice skaters can enjoy the beautifully lit palm trees for an unforgettable experience. “My kids ask me, is that the place with the palm trees? And when I tell them yes, they race to the car,” Yamaguchi said. The http://downtownicesj.com website posts daily hours. In general, during November, early December and after the holidays in January, Downtown Ice is open 5-9 p.m. Monday-Thursday; 5 p.m.-midnight on Friday; noon-midnight on Saturday; and noon-9 p.m. on Sunday. During the winter break, the rink is open 11 a.m.-midnight daily. Special hours apply to the holidays. Admission is $15 for children 10-under and $17 for skaters 11-older. Those who bring their own skates will be admitted for $10. 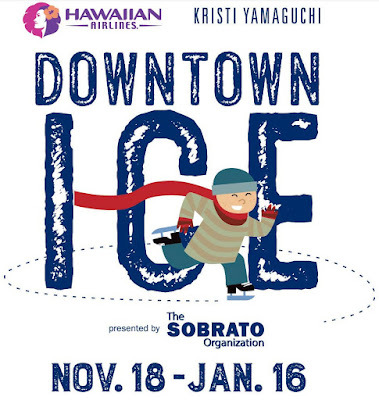 Discounts and details are at http://downtownicesj.com. The rink phone number is (408) 291-0525. Parking information is at http://parksj.org. 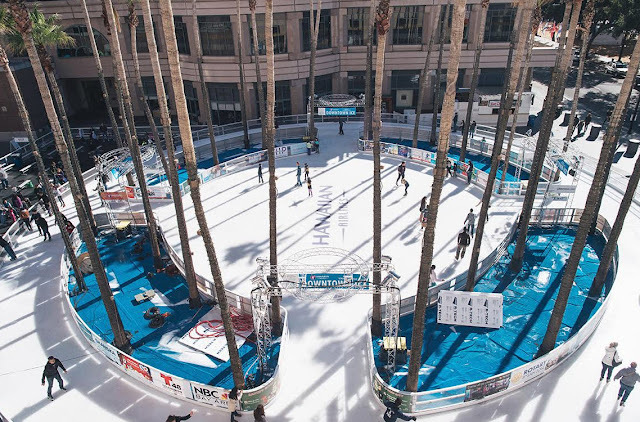 Downtown Ice is located within steps of Christmas in the Park displays, which occupies Plaza de Cesar Chavez starting Nov. 25. These two downtown San Jose holiday attractions are supported in part by participants in the 5-kilometer TiVo Santa Run Silicon Valley held on Dec. 18. Dress up in costume and run a 5-kilometer race as lights descend on downtown. A children’s division will also be participating along with a costume contest with great prizes, some fun mileage markers and surprises along the course. Sign up at www.santarunsv.com. Besides skating, the community can support Downtown Ice in another important way: Make a donation to the Schools on Skates program. Fifth- and sixth-grade students from areas schools – who may not otherwise have the opportunity to go ice skating – take a field trip to skate. Contact Joe Noonan, sponsorship manager, jnoonan@sjdowntown.com. Sunday, Nov. 20: noon - 9 p.m.
Monday, Nov. 21: 5 - 10 p.m.
Tuesday, Nov. 22: 5-10 p.m.
Monday -Thursday: 5 - 10 p.m.
Saturday, Dec. 31, New Year’s Eve: 11 a.m. - 11 p.m.
Cash, Paypal, Visa, Mastercard accepted. Admission includes ice time and rental skates (skate sizes range from toddler 8 to men's 13). Aloha Fridays $10 ticket to anyone wearing Hawaiian attire. Regsiter for a free trip for two to Hawaii.